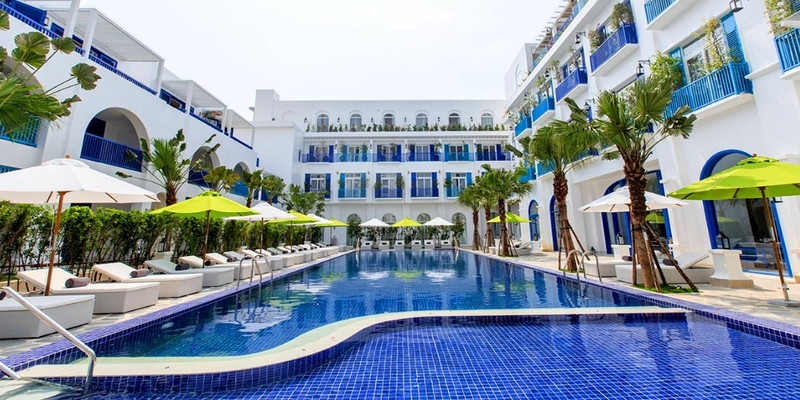 The first resort in Vietnam featuring architecture inspired by the enchanting beauty of Santorini Island in Greece, Risemount Premier Resort Danang is located just ten minutes away from Da Nang International Airport and near the city center and the dreamlike My Khe Beach. Opened in 2016, the 1,000 sq m resort officially received five-star certification from the Vietnam National Administration of Tourism (VNAT) in June. From the time they first enter, guests can take in fresh, open spaces in blue with vaulted ceilings, inviting them to experience Vietnam the Santorini way. The resort has been reviewed as being ideal for businesspeople as well as visitors to the beautiful coastal city. Ms. Bui Thi Phuong Nhung, General Manager of Risemount Premier Resort Danang, is proud of its strength as the first Mediterranean-style resort in the country, combining a variety of open spaces and colors typical of the Mediterranean. It comprises 103 rooms in a range of categories. All are individually designed with guests in mind and feature a bright, clean concept with an emphasis on style and livability. Most are similar, with size being the main difference. The Superior rooms feature a skylight bringing in natural light and are well-appointed, with an open sitting area that provides comfort, while Elite Deluxe rooms are spacious in size and luxurious in style and facilities, featuring a premium sitting area with a veranda offering beautiful views over the stunning pool or the vibrant city. Larger in size, Deluxe rooms have an astonishing view over the Courtyard Pool or the city. Featuring a comfortable seating area and quality furnishings, with coral blue and white dominating, all details evoke a strong sense of Santorini. A contemporary design along with luxurious furniture and amazing views of the stunning pool are the unique features of the Junior Suite rooms. With a separate large wardrobe and spacious premium living area, it certainly makes any stay a memorable experience. All dreams come to life in the resort’s magnificent Santorini Suite, where guest can spend romantic days and nights in the comfortable bedroom, relax in the stylish living room, dine in the premium dining area, and pamper themselves in the luxurious bathtub or shower. The room also features picturesque pool views through a full glass window. Finally, as Risemount’s optimum level of luxury, the Duplex Residence invites the most discerning of guest to experience the true art of living. All rooms come with a spacious living room, two elegant bedrooms, and a private rooftop balcony where you can enjoy relaxing moments. Besides its special design, Risemount Premier Resort Danang also offers mouth-watering cuisine at La Maison, with dishes from all over the world. The Elia Lounge, meanwhile, is the perfect spot to enjoy tea and aromatic coffee, or they can sip on signature drinks and refreshing cocktails at Kapari. The resort offers the perfect mix of open-air and indoor dining and drinking options as well as 24-hour room service. Many functional areas are also found at the resort. The 550-seat convention hall boasts arched ceilings, wooden floors and classic chandeliers for important events such as weddings or private or corporate events. There are two swimming pools: a central pool on the first floor and another on the fourth floor. Many guests prefer to swim in the upper pool because it is more isolated and has a nice view over the city. In particular, Kapari is located next to the swimming pool and an amazing place to sip on a cocktail or enjoy a cup of coffee under a blue sky with a cooling sea breeze. 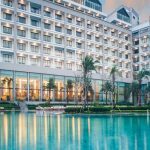 The Risemount Premier Resort Danang has been rated as an excellent resort on Agoda.com, with 8.6 points. Ms. Nhung said that the challenge for the resort is to continue to develop, improving its service quality in a new style: “Resort in the City”. She also believes there is a great deal of potential to develop the resort due to Danang being the most beautiful city on the central coast and with one of the longest beaches in the world. The city is looking to become a green – clean – beautiful tourist city. 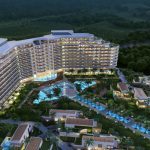 “With its unique design, Risemount Premier Resort Danang will be hard at work trying to develop the Risemount brand into a resort chain – restaurant – hotel managed by Vietnamese,” she added.